We got our review copy of Confetti from publisher RightGames. Thanks a lot! Confetti, colourful round paper shreds that you toss into the air and watch them tumble to the ground, is great entertainment. For six-year olds. So I’ll never know what brought Sergey Machin, author of games like Evolution: The Origin of Species and The Kingdoms of Crusaders, to create a game based on children-entertaining paper shreds. But I’m glad he did, because Confetti the game is much better than mere kid’s entertainment. There are basically two similarities between Confetti and confetti. One is that it’s all about colourful circles, the other the way you play with it: the cards in Confetti are dealt by tossing them in the air, then watching them tumbling down. Then picking up the ones that missed the table. Toss them again. Repeat until they all hit the table. Then turn over the ones that landed with the wrong side up. It may not be very authentic, but we switched to “dealing” cards by spreading them over the table, without the tossing. 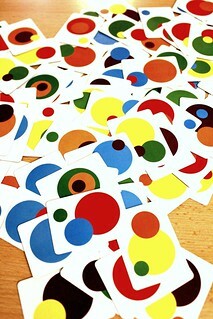 But that’s just game preparations, the colourful circles are more closely tied to how the game is played. 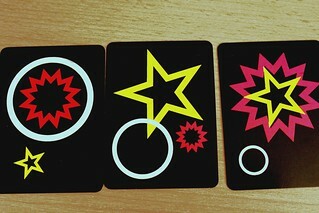 Each card shows three circles in different sizes and different colours. When the timer is turned over, it gives you one minute to chose cards from the big mess on the table. Your goal is to pick a small, medium and large circle of the same colour. That is a set and will give you one point after the minute is over. Since each card shows three circles, you can get two or even three sets out of three cards, if your pattern matching skills are up to it. In the first two rounds you may pick six cards with the goal to make as many sets as possible. That should be six, but I never managed that.To make matters worse, each card you take that doesn’t end up making a set costs you a point again. In round three you can take up to nine cards – that usually ends with even less points for me, I think I may have concentration issues. But just picking up cards would be too easy, of course. So you’re not allowed to pick them up. You may use one hand to slide cards over the table towards you. The other hand you need to hold on to the cards you already took, because anything that doesn’t have a hand on it is free to be taken by another player. And so is everything that another player didn’t hold on to tightly enough, with a friendly shout of “You didn’t hold on tightly enough”. That’s not actually in the rules? That’s what I said, nobody cared. If you want to stick to the rules more closely though, I’d recommend you watch for that moment when the player next to you lifts both hands to figure out which card he still needs, then you strike and take the card that you need. It’s that kind of game. Confetti isn’t a complex game by any stretch. It plays in five minutes, and that’s still longer than it takes to explain the rules. But it’s by no means mindless; instead of the usual planning skills most games demand – at least the ones we tend to review – Confetti is a challenge for your pattern recognition skills. That’s not an entirely new concept, other games like Set have targeted the same area of the brain, but the mix of pattern recognition with free-for-all card grabbing, all while you keep an eye out for chances to steal from your opponents, works particularly well for me. Of course, the game deteriorates into utter chaos when you’re playing with up to seven people. And that makes it even better, chaos is exactly what this game is good for. Except the chaos that comes from playing in low light and being unable to tell the colours of the circles apart. That’s the bad kind of chaos. But fortunately the backside of the cards features different shapes instead of just different colours, making playing in bad light much easier and also making the game playable for colour blind people. Great idea, it just works for everyone. Confetti is a really simple game, but it’s also a very fun game, especially in bigger groups.